I really feel that i need to do my blog version (appropriately filtered as a public facing note) of the post mortem on the Flock Gloss product and launch before it gets any hazier in my memomory. Flock Gloss, you can see it at http://browser.flock.com/gloss was the second affinity edition i worked on. The goal was to show how we could take the affinity edition concept and it apply it to an entirely different content vertical and media space then the first one, Flock Eco. Flock Gloss was 100% focused on stratifying the online fashion, celebrity, and shopping niches into one web browser that was fashionista ready. The Flock Gloss product concept was the same as the first version of the Affinity editions ideas as found in Eco. The goal was to add a custom theme, prepackage a good dose (35 web content sources) of RSS feeds, pre favorite media streams from youtube, picasa, flickr, truveo, and last but not least add Favorites and Favorites Toolbar links. 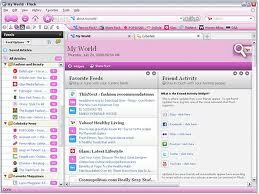 Enabling a revolutionary "window shopping" experience like no other browser !! In Gloss though we added a unique twist by enabling a shopping experience via the media bar. Since, Flock Gloss is based on V 1.2.4 it supports the use of media RSS in the media bar. Meaning we added a custom media bar service for Flock Gloss. The service is www.designerapparel.com an online retailer that sells top designer brands like armani, prada, burberry etc. So now you could open up your Flock media bar in Flock Gloss and type in keywords like shoes, heels, dress, jeans, etc into the designer apparel search service. Then you would have dozens of thumbnails of those products stream across the top of your browser in the media bar. If you clicked on any one of the resulting clothing products thumbnail Flock would take you directly to the page where you could purchase that item from. The inclusion of Designerapparel.com in Flock's media bar is a very innovative step forward in the browser world for enabling better e commerce experiences/ shopping for clothes online in an easier and funner way. As part of the BD groundwork for Flock Gloss I ended up talking with a lot of folks in this space. Everyone from InStyle.com to other prolific fashion media brands to fffabulous.com a personal blog about fashion of a Yahoo Product Manager, to Designersagainstaids.com to revolveclothing.com to Guy Kawasaki's Alltop site, and first and foremost the Sugar network of sites like www.popsugar.com and bellasugar.com ( Can't forget thisnext.com either) the list goes on and on. My Favorite site that we featured is www.designersagainstaids.com i think its a great cause and a true example of how pro active consumerism can actually be used in a good way versus just trying to ride the band wagon. It was very interesting to adapt my BD pitch from the Eco space to the Fashion space. It definitely taught me a lot. All in all we got the product up and running and out the door with some notable names in this vertical. It will be interesting to see where this edition is 6 months out from here and 12 months out. Stay tuned for the post 6 months evaluation of where the products are ;) cheers. Find the latest fashions for the best prices at iStorez. It's an online shopping destination like no other—completely focused on up-to-the minute store specials from the leading retailers and brands (in beta now, and will launch this Fall). You can search by item type, category, “what’s hot,” occasion, theme, and even personality – unique to iStorez. So instead of spending hours looking through email newsletters or sifting through the hordes of online shopping sites, iStorez aggregates all the latest specials from the major brands and stores, presenting them to you in a single location. iStorez will launch publicly in the fall. But until then, the beta site is offering a lot for you to discover today, like eco-fashion, back to school and fall designer previews. Check it out! http://www.istorez.com/.